In the early days of Sound Guys (okay, it was like a year ago) we reviewed the Audio-Technica ATH-M50x and, like everyone else, thought that they were a fantastic pair of headphones. From monitoring to mixing to simply listening to your favorite music, they excelled at it all, and all for a surprisingly low price. Strange creatures that people are, we constantly found people asking when the company would replace them with something better. Whether or not the Audio-Technica ATH-M70x headphones are better than the ATH-M50x is a good question, but it doesn’t seem to be one that Audio-Technica has an interest in answering. Instead, they claim that while the ATH-M70x is the company’s new flagship in that line, both models are great. After testing, we’re inclined to agree. There is one important difference here: the price. The ATH-M70x list for $419, quite a bit more than the ATH-M50x. Open the box and the only thing you’ll see is the hard-shell carrying case — everything else is inside. Open the case and the headphones make their first appearance, with a small pouch nestled between the earcups and the headband. Inside the pouch are three cables: a short straight cable, a long straight cable, and a coiled cable, complete with 1/4″ adapter. 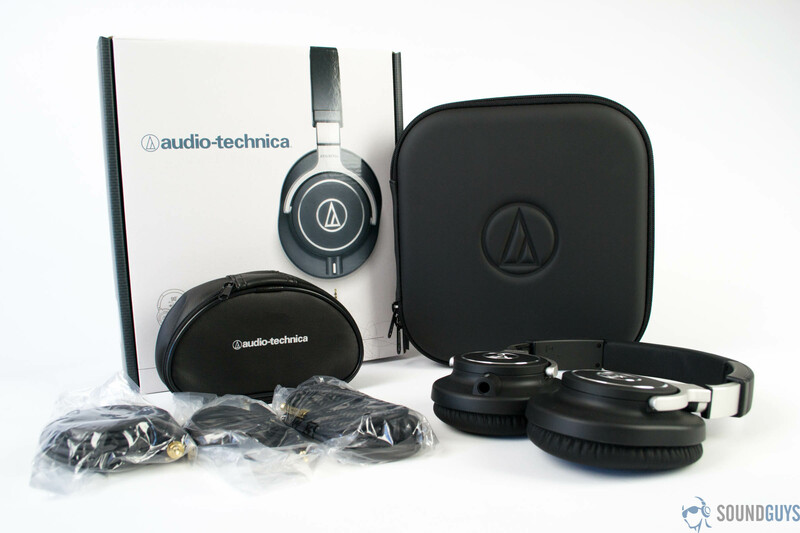 Unlike the ATH-M50x, the Audio-Technica ATH-M70x are only available in black. At least, for now. Depending on how well these sell, it wouldn’t be surprising to see other color options become available in the future. The look is very similar to the ATH-M50x, and the ATH-M40x too, for that matter. That isn’t to say that there is anything wrong with that — why mess with a classic? That said, don’t let the similarities in appearance fool you into thinking that these are the same. The build incorporates much more metal than other models in the line, particularly in the yoke and back of the earcups. This makes for a very slight increase in weight, but it is barely noticeable. What is noticeable is that, unlike the ATH-M50x, these aren’t collapsible. This wasn’t an issue to me, and I actually prefer them this way, but if you frequently travel with your headphones the larger footprint might be a problem. Fortunately the case will at least keep the headphones well protected. While comfort was an issue in older the ATH-M50 headphones, the ATH-M50x seemed to improve this, and the ATH-M70x were very comfortable. The only issue I noticed during testing is that they could start to feel a little warm after a while. In the cold New York winter this was actually welcome, but it may not be as welcome in warmer climates. As mentioned briefly above, the Audio-Technica ATH-M70x headphones offer three different cables out of the box. These are professional monitor headphones, so it should go without saying, but I’ll say it anyway: none of these cables offer a mic or remote. The shorter straight cable is 3.9 feet (1.2 meters) in length, while the longer cable is 9.8 feet (3.0 meters) in length. The coiled cable is the same as the shorter cable when laid flat, but stretches up to the same length as the longer straight cable. The 1/4″ adapter is attached to the coiled cable out of the box, but can be used with any of the cables. Like other headphones in this line, the ATH-M70x headphones use a proprietary locking connector on the headphone end, so while the cables are removable, it isn’t quite as easy to find a replacement cable. They are available, but we’ve had readers report that they aren’t exactly easy to find. Often in this price range, a headphone amplifier is required for the headphones to work as intended. While most of my listening was done through the headphone amp in the Focusrite Saffire Pro 40 audio interface, I did plug the ATH-M70x into both an iPhone 5s and Nexus 5 to see how well they would work. Both phones powered the headphones just fine, though you’ll still see the best results with a dedicated amp. One of the main differences between the ATH-M50x and the ATH-M70x is that these offer a greatly extended frequency range. The lows here are claimed as reaching down to 5 Hz as opposed to 15 Hz in the M50x. Deep lows feel very deep, and lows are very accurate, with no boominess in the 80 – 200 Hz range. While the bass extends lower than the M50x, the lows aren’t hyped in the same way as those headphones. There are no dips in the midrange, which may lead to these headphones sounding more mid forward than many people are used to. This is great for monitoring purposes, but for mixes that boost certain mids to grab attention, it can come across as overbearing if you’re listening at home. The highs are clear and strident. Again the extended frequency range comes in to play here, with the highs topping out at 40,000 Hz unlike 28,000 Hz in the ATH-M50x. This ranges into frequencies that humans simply can’t hear, but it doesn’t mean that they can’t be felt, and the extended range is very useful for mixing and monitoring purposes. The soundstage is good and the headphones offer strong spatial cues, but as I’ve already mentioned, these headphones only show you what is there, so if you’re listening to a mix with a muddy stereo image, these won’t do anything to improve it. While the ATH-M50x were aimed at everyone, and made some concessions to that effect, the ATH-M70x are aimed squarely at pros, which means they may not quite sound as you would expect. Many consumer focused headphones purposely massage frequencies to make listening more pleasant, and that’s great if you’re listening to music for enjoyment. On the other hand, if you’re mixing a song, you want to hear every single thing that is wrong with it, and that is certainly what these headphones do. In the pro audio world, people get very used to paying huge amounts of money for marginal gains in performance, because every little bit adds up and this shows in the final product. While this generally applies to paying a few thousand dollars for a slightly better compressor, the same goes for the monitoring chain. In that case, the better frequency response and somewhat flatter response curve are absolutely worth the extra money. 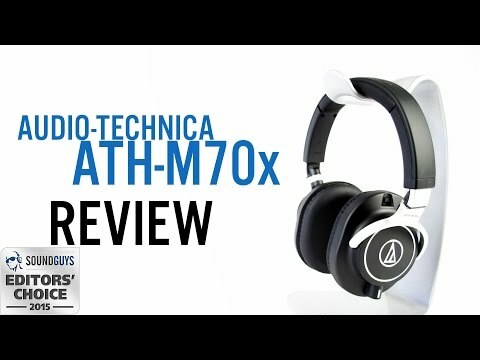 To repeat the question from the top of the article, are the Audio-Technica ATH-M70x better than the ATH-M50x? I’m inclined to say yes, slightly, but I’m not sure that a lot of people will agree as it’s mainly a matter of personal preference. If you’re planning on spending up to $500 on headphones anyway, make sure you at least take a look at this pair. If you’re just looking at mixing your home recordings on a budget, stick with the ATH-M50x or even the ATH-M40x.